How are You Planning to Use the Home? Are There Questions of Accessibility? Is There Enough Indoor Recreation Space? How Much Outdoor Living Space Do You Need? 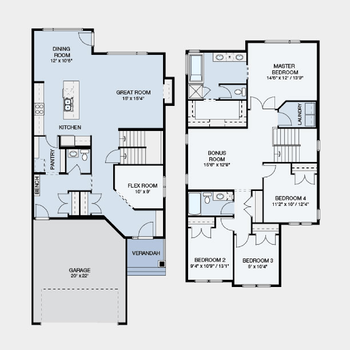 So what is the best way to ensure you choose a great floor plan for your family? Well, that's why you're here! We've got some key considerations and questions you should be asking yourself to help you make the right decision when it comes to your new home. Your family may not need a massive estate, but a two-bedroom house would be much too cramped. The size of your family and the ages of your children are essential considerations when looking at floor plans. You may need a layout where your children are grouped together and are close to the master bedroom, especially if they are younger. You'll likely want bathrooms nearby as well. Conversely, older children and young adults probably don't want bedrooms near mom and dad. Consider their space and where they fit best. Look at the floor plan of new spaces, comparing them to your current one. Think about how the new home will improve on the spaces you're used to. Home floor plans should be designed to feel welcoming! Many use an open concept plan, which helps promote entertaining guests. Today's homeowners want a "wow" factor within their home. Think wide foyers that lead to open floor dining and living spaces that lead easily to outdoor spaces for lounging. However, you may prefer more private spaces, opting for a living room closer to the front door. This way guests can be seated right away, leaving the rest of the home to be visited at your leisure, if at all. There are homeowners who prefer the convenience of bungalow style homes. There's no overhead traffic and less space to maintain. 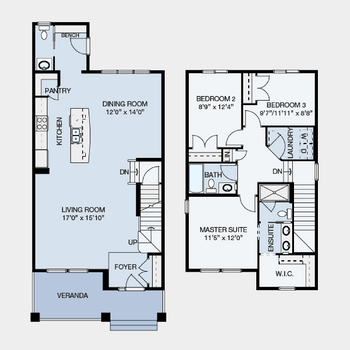 Bungalow story or ranch style properties will have floor plans with central living spaces. Baths and bedrooms are usually located on the outskirts of the floor plan. If that doesn't sound like your style, maybe you're a lover of the two-story home. These can be either a rear-lane or a front attached garage home. Two-story homes let your family members branch out into their own spaces, providing more privacy than single story options, while still having central living spaces where the family can spend time together. Maybe you have younger children who need plenty of room to play, along with space for all those toys! Perhaps you have a family member with unique needs or who requires extra space to maneuver? Look at spaces that will give you ease of movement. Open floor plans make it easy to get around while at the same time providing plenty of space to add structure with furniture and decor. If you have a large family or plan to have one, bonus and common rooms should be a part of any floor plan you're considering. These are expansive spaces that can serve more than one purpose. They're excellent for entertaining, especially if you don't want kids running around the house with guests. Some floor plans are smartly designed with a kitchen overlooking the area. Another option is a flex room. 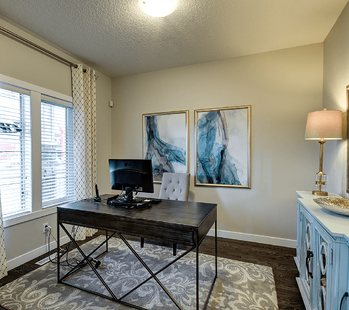 One of the best uses for a flex room is a home office. Since a lot of floor plans have this room near the front of the home, you can keep this area private from the rest of your home. Okay, so technically the outdoors isn't actually part of the floor plan. However, you'll still want to take a look at what kind of outdoor spaces are available depending on the model you choose. You'll need to determine if these outdoor spaces can be put to use. You also want to factor in maintenance. These areas require upkeep, time and money. The larger the spaces, the more energy it will consume. You have to decide if you want the responsibility of managing the outdoor plan and if the outcome is worth it. It's a good idea to contact a builder representative that knows the area you're looking into. Their expertise will be invaluable. They'll have insight on the specifics of your ideal family floor plan in relation to what's currently on the market. In addition to finding the right home for you, builder reps can provide you with other critical information like energy costs and savings, location of important resources like medical centres, malls and schools, affordability of mortgage payments and community information. Don't discount your instincts when going over existing floor plans. Sometimes all you need is that spark, that feeling that says "this is the one". Granted, home type, design, location, neighbourhood and more will have to be considered alongside criteria like maintenance and potential expenses. However, if it truly feels right, then it probably is. Larger rooms may look grand and spacious, but they will also require more heating and cooling, which raises your utility costs. Additionally, if you have too much space you can become disconnected from one another within your home. 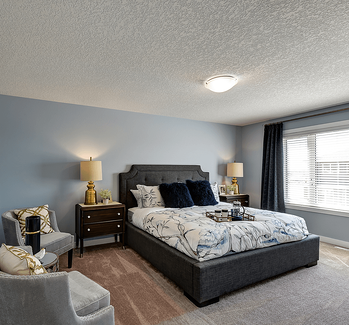 The goal is to find a floor plan that has open areas and enough room for everyone, so you all can have the privacy you need and still have places where you come together as a family. Sometimes the “show home" look of a particular floor plan model can be misleading. The kitchen will look perfect because of the appliances, pots hanging from ceilings, islands and amazing counters. Beds and furniture can dazzle! Try to see the home stripped down, leaving you nothing but the walls and square footage. The carpet and double sink shouldn't impress as much as getting the feeling the spaces have a welcoming feel that will bring comfort for many years. From the warmth of the foyer to the ease of getting between the patio and kitchen, there should be flow and function in the floor plan. Simply put, it needs to fit your lifestyle. These tips will be a big help in selecting the perfect floor plan for your family. The key is to find a comfortable, welcoming home that will give you and your loved ones a place to grow and create memories. Originally posted June 23, 2016, updated March 19, 2019.